Imagine taking a good-sized bookstore, picking it up, and shaking its contents out onto a football field. Somewhere in the resulting pile of books lie the works of Aristotle, Newton, and Auden, but if you wade in and start picking up books at random, you’re much likelier to get Love’s Tender Fury and Chicken Soup for the Hoosier Soul. We’re so used to the way a bookstore is laid out that we don’t notice how much prior knowledge we need to have about its layout and categories for it to be even minimally useful. 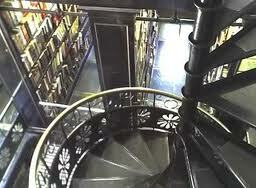 My favorite bookstore in the world (sadly now closed) was built inside an old Carnegie library in Parkersburg, WV. The summer before my senior year of college, I had an internship in the business right next door to Trans Allegheny Books. The very best part of that internship was spending lunch breaks browsing through the dusty collections of used books. A first-time visitor might not have appreciated the collection. Indeed, most visitors came for the wrought-iron spiral staircase that wound its way through three stories of glass-floored stacks. The casual visitor could find great bargains on the mid-century-vintage hardcover fiction and non-fiction resting on original, turn-of-the-century shelving. Dedicated bibliophiles might venture away from the stacks into the third floor room that held late 19th-century copies of classic novels. Only the really dedicated browser would notice that paperback fiction resided in much-less-glamorous basement. Those who loitered by the checkout might also notice the first editions and more-than-a-century-old books in the locked barrister cases. My Trans Allegheny collection includes dozens of paperback SF novels, a first-edition of one of Charles Dickens’ more obscure books (a graduation gift from my brother), and a ratty copy of David Hume’s five-volume History of England that I dug out of a box in the corner of an upstairs room whose dust was thick enough that I could see my footprints. I spent enough time in Trans Allegheny to learn my way around its unorthodox organization. There was a method to the apparent madness—one that became apparent to anyone willing to spend a bit of time exploring and a bit of energy deciphering the patterns. A couple of conversations with the owner (who was frequently the only salesperson) confirmed my observations. It was an arrangement that made perfect sense to the owner: the least profitable stuff goes in the basement, the stuff with good profit margins goes in the heavily-trafficked area, the obscure harder-to-sell stuff goes where only the bibliophiles go, and the really valuable stuff stays where he could keep an eye on it. If your use-case is: I want to maximize my profits selling books, then this was a perfectly sensible arrangement. It was also a pretty good arrangement if your use-case was: I want to spend an hour poking around a used bookstore and maybe uncover a hidden treasure. If your use-case was: I want to see every book you have by Charles Dickens, it was a less useful arrangement. Trans-Allegheny was built on the assumption that most of its customers were not in that last category. Used bookstores—especially those housed in uniquely-lovely historic buildings—can afford the luxury of an idiosyncratic information architecture. Casual browsers just need to be able to find the Chicken Soup section. Regulars are there because they like being there. They’re not just willing to spend the time learning their way around. Most of them actively enjoy poking through the boxes in the corner, never knowing what they might find around the next bend. But website visitors aren’t really like patrons of used bookstores. Indeed, the runaway success of Amazon (and the corresponding decline of used bookstores like Trans Allegheny) seems to provide pretty reliable evidence that the majority of book-buyers aren’t like patrons of used bookstores. They much prefer the See everything by Charles Dickens arrangement. The big brick-and-mortar bookshops have all recognized this basic fact. One Barnes and Noble looks pretty much exactly like the next. And, frankly, if you swap out a few signs, you could convert a Barnes and Noble into a Waterstone’s without much trouble. That uniformity is what allows everyone and her brother to find a copy of The Girl With the Dragon Tattoo. We’d like to think that all our visitors are really interested in first editions of obscure Dickens’ works. But in fact, they are (mostly) uninterested in exploring the dusty corners of our websites for undiscovered gems. They just want The Girl With the Dragon Tattoo and they want it now. If you don’t have it out in plain sight, someone else will. And the next website is just a few keystrokes away. If we insist on an information architecture that forces our users to become used-bookstore junkies, then we run a very real risk of going the way of Trans Allegheny. What a great analogy. Totally aside from the meat of this article, I sure do miss the Trans Allegheny – I spent hours and hours there after my 8:30 am classes ended and before my 6:45 pm classes began. Their layout was always puzzling to me, but now it makes total sense. I never stopped to think about how the layout was designed to maximize profit, I always just stepped in and headed straight for the basement; I still wished I’d picked up that ancient copy of Winesburg, OH.